My partner is a Jordanian national and we applied for a tourist visa to Cyprus. We had everything in order but they rejected him because they were not satisfied with his hotel booking. It was a perfectly good hotel. We supplied our online booking email confirmation and it was not accepted. When we enquired, they said they wanted a letter faxed by the hotel manager, not an online booking. Fair enough, lesson learned, no big deal. We did not appeal. But in the refusal letter provided, they ticked the first box saying "a fraudulent/counterfeit/forged travel document was presented". To me that sounds a lot worse than an unacceptable online hotel booking. Now, we must disclose visa refusals in our application for a visa to Ireland, and the employee we spoke with at the Irish consulate is alarmed by the "forged travel document" box being ticked and seems to interpret it as an accusation of having a fake passport, not a fake hotel booking. 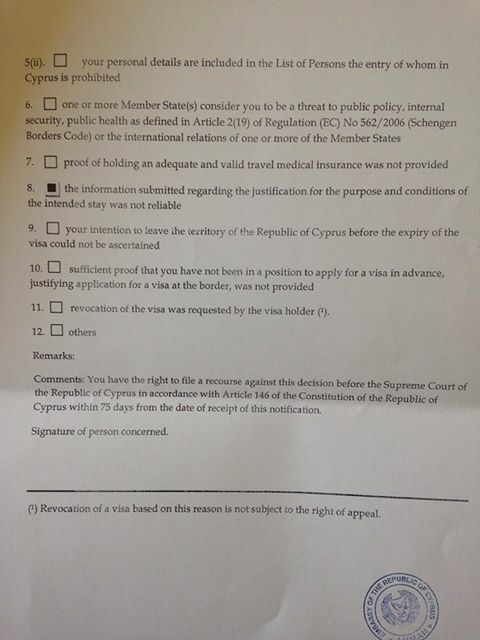 They advised us against applying until we appeal this, but based on our understanding of the Cyprus refusal being vis a vis the hotel booking, which is cancelled anyway, this seems rather pointless. My fear is, me being an Irish citizen, that my partner now is going to face many issues coming with me to Ireland every time we travel. What do you think? UPDATE: Well we subsequently found out the 'travel document' referred to was in fact the hotel reservation. The Cyprus embassy wanted a reservation letter faxed directly from the hotel which seems a little odd to me but I'll remember it in the future. However the wording of this paper is poor and was questioned by the Irish Embassy who contacted us specifically to review this in our application but ultimately they were very understanding and we got the visa we wanted. I can only commend the professionalism and support provided by the Irish Embassy - I wish I could say the same for the Cyprus Embassy! You are right to be concerned. The term ‘Travel document’ does not generally refer to a hotel booking https://en.wikipedia.org/wiki/Travel_document Your partner should seek advice from a lawyer with immigration expertise. is there any reason why you think they concluded it to be a false document? Did they confiscate the passport? Looks to me like a clerical error. A good start would be to get a letter from the Jordanian authorities confirming the authenticity of the passport. 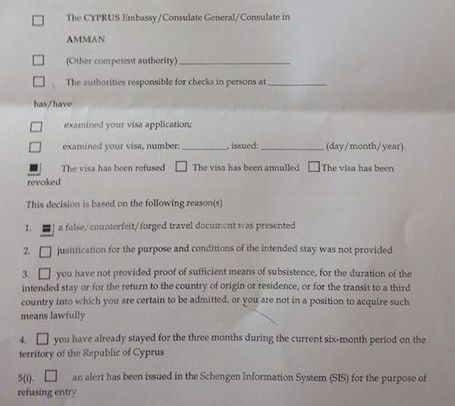 Even though the period of appeal has passed, you should contact the Cyprus consulate and ask them for a confirmation of the refusal reasons in writing. You can also get the document examined by a forgery expert in Ireland. In my view, unless your wife is found guilty by a court, this is still an allegation which isn't necessarily going to affect her Irish visa provided you have evidence why this wasn't a forged document. A good solicitor will be able to help you with this. Not the answer you're looking for? Browse other questions tagged visas visa-refusals ireland cyprus visa-rejections or ask your own question.